The last time this particular area was surveyed was for the creation of navigational charts, between 1900 and 1938, but without accuracy or data density that the multibeam sonar being used today has. Once this portion is surveyed, the entire fault will have been mapped. The mapping has been done by the USGS, the Canadian Geologic Survey, and NOAA. The photo above shows the features of the sea floor. It is set on top of a navigational chart. You can see the numbers on the old chart that represent depth reading. 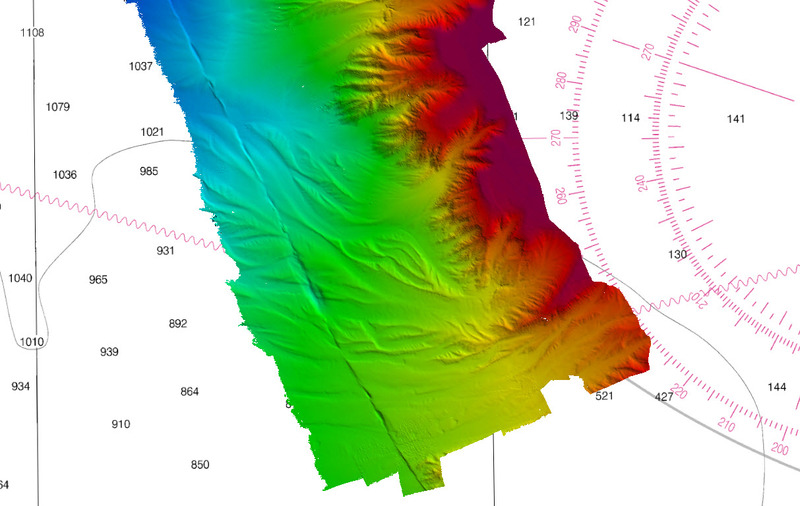 The data collected today shows depth for the entire area mapped and the features on the sea floor. Looking at what NOAA Ship Fairweather has already mapped, the fault is very distinct as are the channels that have been offset by past seismic activity. These channels were created from runoff as the glaciers receded from this area 17,000 years ago. Using the offset measurements and the time since the canals where formed, scientists have given a slip rate of 5.5 centimeters per year to this area of the fault. This makes it one of the fastest moving continental – ocean transform boundaries. NOAA ship Fairweather has sonar that was built for detecting hazards for surface navigation, but it is capable of surveying to several kilometers in depth. The survey team has figured out how map at these great depths up to 2,100 meters. It involves going slowly over the area, and gathering richer data by going over part of the previous survey lines. This is much like painting a wall, where the painter overlaps their brushstrokes so there are not gaps in the coverage. The multibeam solar is also directed in a narrow band, at this depth, for more accurate data. The blue squiggly lines show where mapping is happening. The other colors are where we have been. Why do you think this information is wanted by geologists? The fault has produced at least seven earthquakes with a magnitude greater than 7. An 8.1 magnitude earthquake was generated from this fault near British Columbia in 1949. To date, it is the largest Canadian earthquake recorded. In 1958, a magnitude 7.8 earthquake above Lituya, Alaska created a massive underwater landslide which produced a tsunami sending water 525 meters (1700 feet feet) up a mountainside. More recently in 2012, a 7.5 magnitude earthquake was measured from this fault, and in 2013, Craig, Alaska was hit with a magnitude 7.5 earthquake. 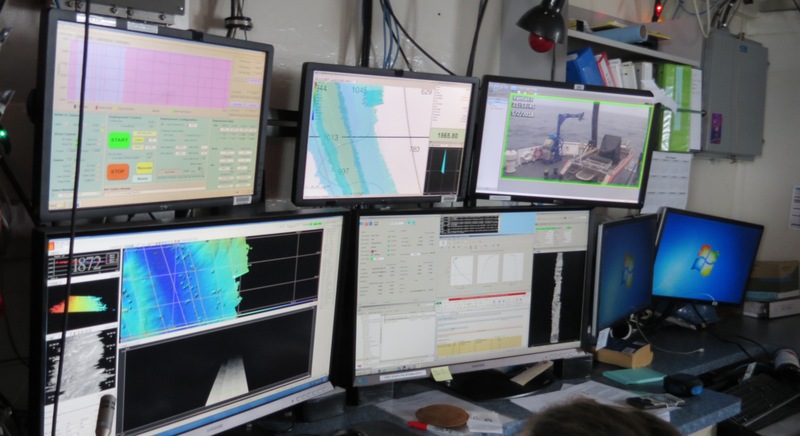 These five screens are used by the survey team when the multibeam sonar is in use. Scientists want to know more about this fault, which could cause further damage to areas of southeast, Alaska. From the seabed mapping, geologists hope to better understand the slip rate and the intervals between earthquakes. I have been so impressed with the people on NOAA Ship Fairweather. Everyone has been so welcoming and kind. This small group of people living in small quarters could be difficult for many people, but everyone here is so enthusiastic about the mission and their jobs. They are very open to sharing what they know with me, including explaining the science and technology of the equipment and how the ship functions. It has been really fun learning about this fault and the surrounding underwater topography. Being able to see the sea bottom as we continue over it is amazing! I am so happy I will get a chance to share this science with my students. I hope they noticed, as they read this post, the highlighted terms and concepts that we learned this year about faults and earthquakes. I found a term that was new to me, tectonic geomorphology. It is the study of the interaction between active plates and land process, and how these shape landscapes. “A Closer Look at an Undersea Source of Alaskan Earthquakes.” Earth and Space Science, vol. 99, no. 2, 2018, pp. 1–6. 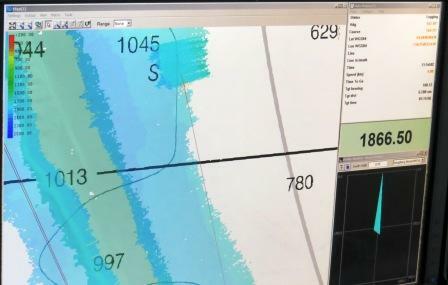 This entry was posted in 2018, Cynthia Byers, NOAA Teacher at Sea and tagged Fairweather, Hydrographic, NOAA Ship Fairweather, survey. Bookmark the permalink. Great post. I am eager to share this information about mapping the fault with my students. Look up the engineer on your ship, Nikko Lagen and tell him hello from Barney! Have great trip. I will do that! It has been a thrill to see this fault and the surrounding topography! Just south of this area is a mud volcano!